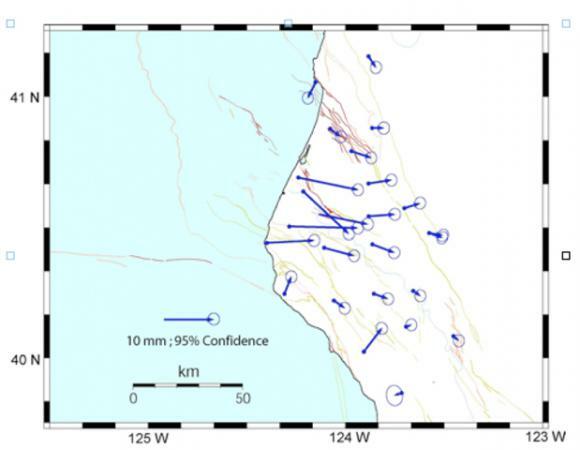 On Jan 9, 2010, a Magnitude (M) 6.5 earthquake occurred offshore of Northern California ~ 30 miles WSW of Eureka, CA (Figure 1). 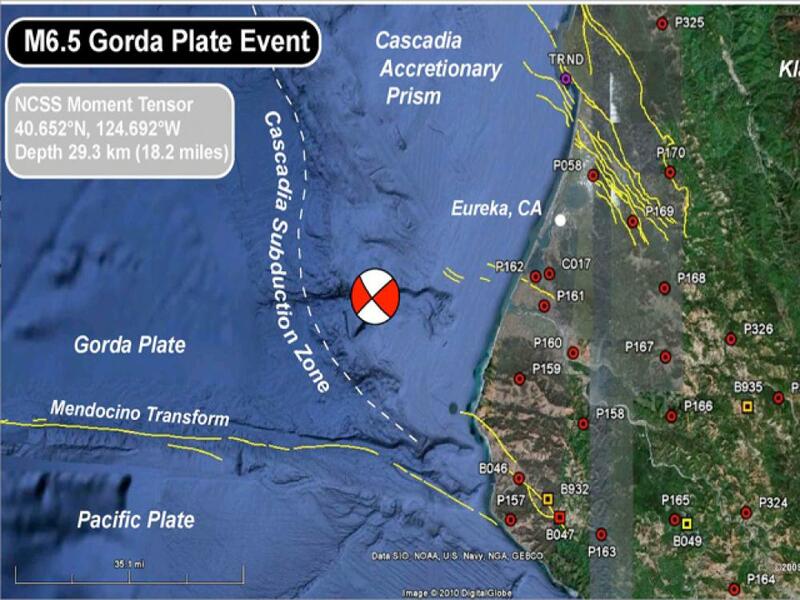 As reported by the USGS, the event occurred within the Gorda Plate on a near vertical fault plane oriented ~ N 47 E. This region of the Gorda Plate is subjected to intense compressive stresses by oblique-convergence of the northwestward migrating Pacific Plate. The resulting internal deformation of the Gorda Plate is manifested primarily by intraplate strike-slip events on vertical NE-oriented faults. Strike-slip motion of the NE-oriented Gorda plate faults is left-lateral, antithetic to the right-lateral NW-oriented faults of the San Andreas fault system. 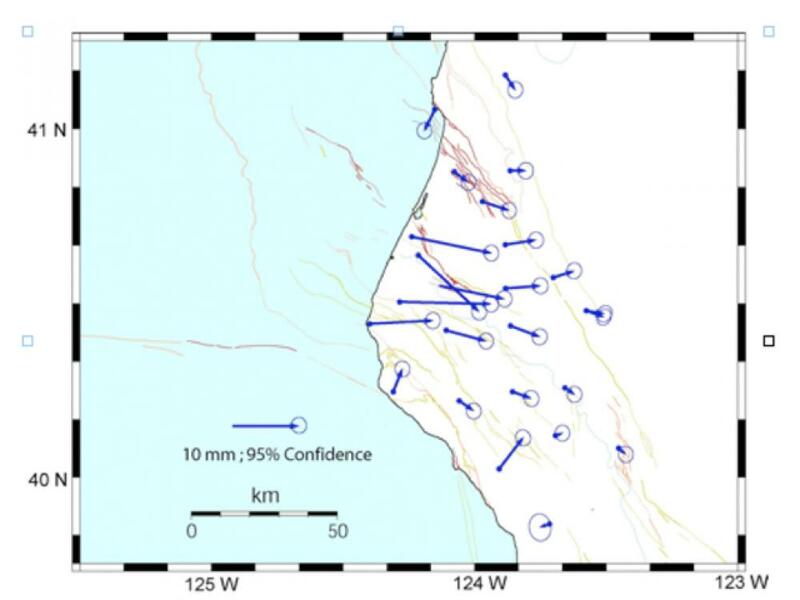 Approximately 20 EarthScope-Plate Boundary Observatory (PBO) GPS stations in the region ‘captured’ the M6.5 earthquake, recording permanent ground shifts due to the energy release. Jerry Svarc and Jessica Murray-Moraleda at USGS-Menlo Park calculated displacements of PBO stations for the event. Most PBO stations affected by the earthquake recorded eastward-directed displacements which are measurable from ~2-3 mm to ~1.5 cm (Figure 2). 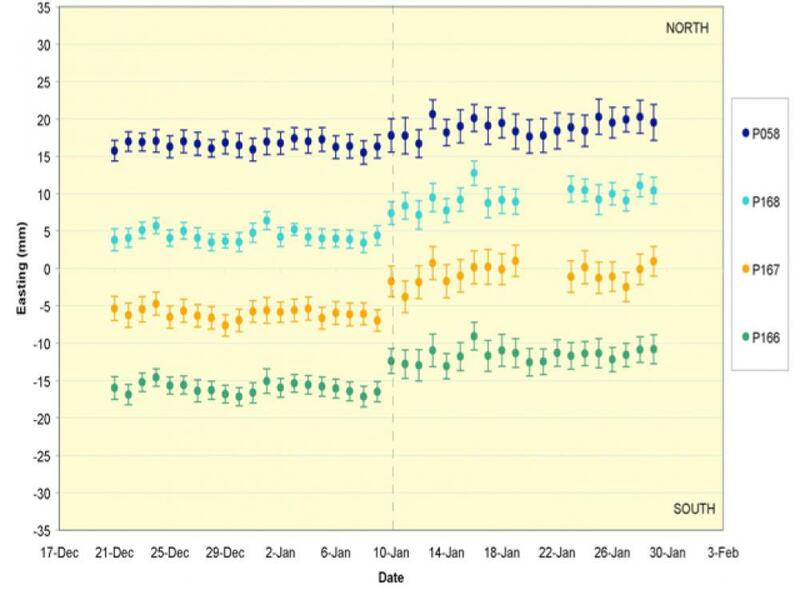 Time series plots of selected PBO GPS stations shown in Figure 3 are from PBO daily solutions freely available GPS/GNSS Data at UNAVCO. Many stations operate on DC/solar power for cellular or radio data modems and were unaffected by ground shaking or local power outages. Those stations reliant on AC power are located at local elementary, community college, and university locations and had adequate backup power for prompt daily downloads. 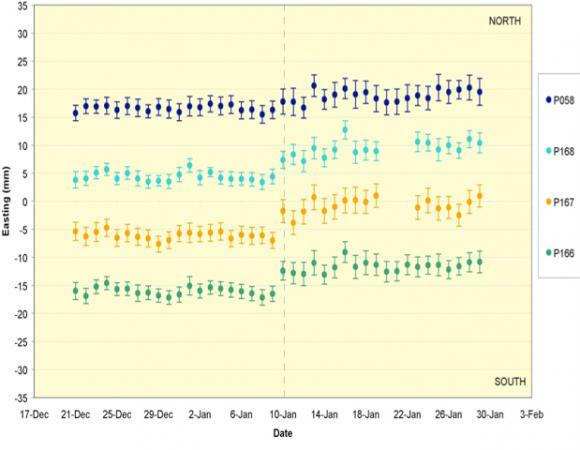 Many of the station time series plots reflect ‘rapid’ versus ‘final’ solutions and some recent post-earthquake daily downloads were delayed due to ongoing winter storms effecting radio transmission (eg. P167 & P168). These files have since been retrieved and are available for, ‘final’ PBO solutions. 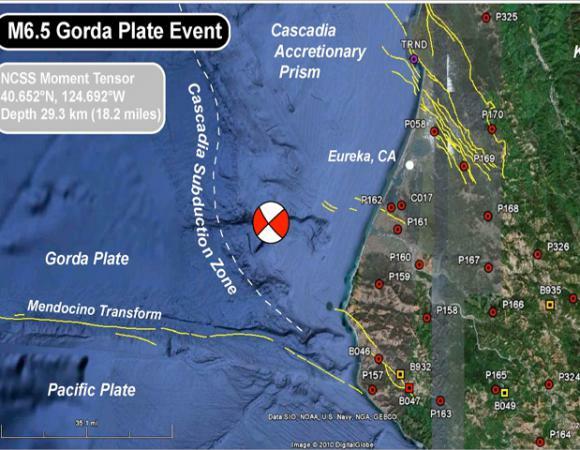 This event is the largest earthquake to occur in this region since the April 25, 1992 M7.2 Petrolia and the June 15, 2005 M7.2 Gorda plate earthquakes. 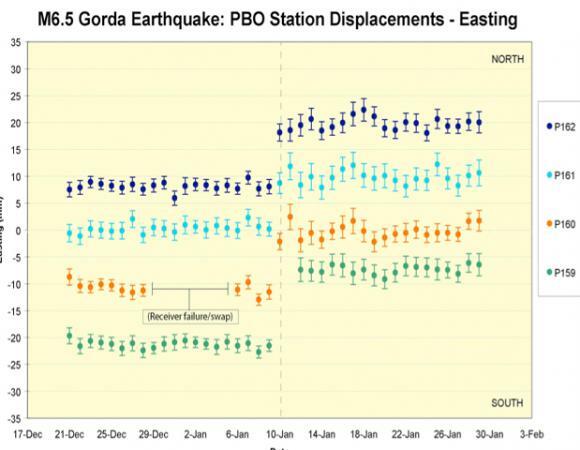 The 2005 Gorda Plate event also permanently displaced six PBO stations (P170, P169, P162, P161, P160, P158) that existed at the time. 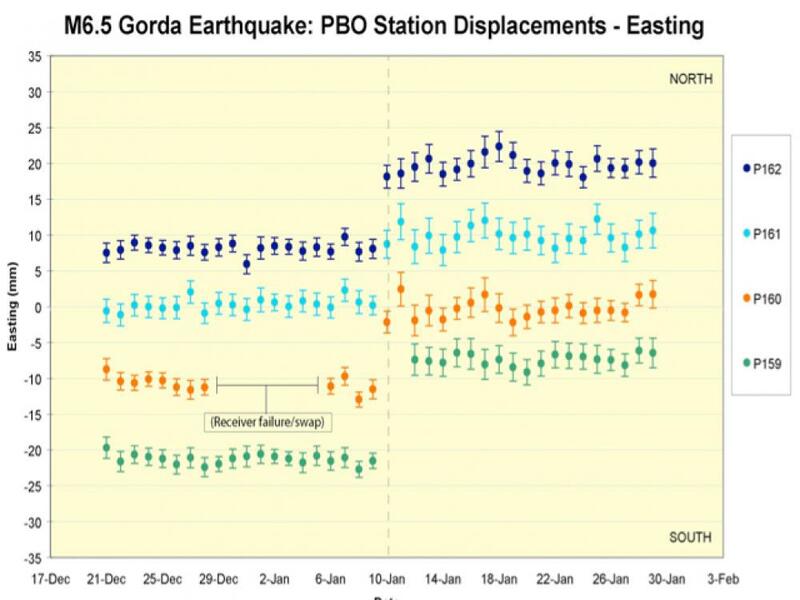 The displacements recorded at onshore PBO stations after offshore Gorda Plate earthquakes suggests strong coupling between the Gorda Plate and the accretionary prism of the southern Cascadia subduction zone in this region.